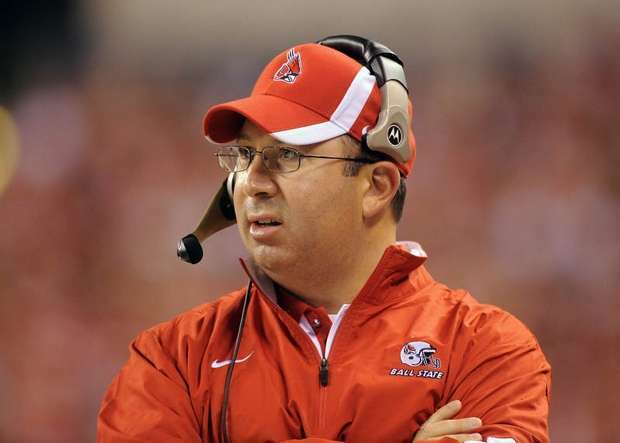 Pete Lembo is off to a bang up start. Can it continue in Tampa? The Big East has gotten quite the bad rap in recent memory as a conference loaded with paper tigers who have no business being considered among the nation’s elite, and for the most part they would be right. But USF is different. For a program that has only been playing football since 1997, South Florida has done it well and done it consistently since their inception. Now they have a tried and true winning coach in Skip Holtz, who is perhaps the most unappreciated and underrated coach in the country. One of, if not the, biggest wins in program history came last Saturday for the Bulls. By beating the Fighting Irish in South Bend, the Bulls have launched themselves not only into the polls, but the national conversation. How this team responds to the sudden interest by the talking heads and media types could make a significant difference in their preparation for Ball State. The sports marketing department is working overtime to pub and sell this game. Tickets are available for just $6.20 per seat, there are fireworks after the game, and judging by the choose your own seat application on their website, there isn’t a lot of tickets left. After last Saturday, it’s probably safe to assume that interest in the Bulls in the Tampa area is at an all-time high. To call USF’s home stadium the friendly confines is not even adequate. The Bulls are 14-0 in Raymond James Stadium in home openers, with the average margin of victory at a staggering 32 points per game. Their closest home opener in the last five years was the 2007 contest against Elon, a 28-13 win, when Elon was coached by one Pete Lembo. The numbers of returning starters for the Bulls is only 11 across both units, but the number of starters and backups that saw game action and earned a letter last season leads the Big East. USF may not have a mass quantity of starters back, but they are a deep experienced team that is capable of rotating serviceable backups in without a dropoff in production. Daniels is a mobile QB capable of beating a team through the air or on the ground. Remember Dan Lefevour? The Cards have struggled with dual threats in recent memory. The leading returning receiver for the Bulls from last season, Landi was limited to just three catches against the Irish. One of those, however, was a TD, and Landi is a sure-handed tall target for Daniels. The Bulls’ #2 tackler last season, Lattimore presents a key matchup for the BSU o-line. Capable of penetration, QB pressure, and tackles for loss, Lattimore may be the biggest hindrance to establishing a running game. Similar to Sean Baker, Lejiste is a hard hitter who has a nose for the football. A 3rd team All Big East selection last season, you’ll see Lejiste sent on blitz packages as well as playing coverage against the pass. The Fighting Irish held USF to 126 yards on the ground and 128 yards through the air. They also held the USF offense touchdown-less until early in the 4th quarter. Along the way, ND ran up over 500 yards of offense and held the Bulls to just 2-14 on 3rd downs. Notre Dame also averaged 4 yards per rush, a stat that I wouldn’t mind seeing repeated from the visiting team on Saturday. The Fighting Irish learned the hard way that no matter how dominant the box score looks, five turnovers will kill you nearly every time. Making mistakes or turning the ball over at any point against any opponent is a bad thing, but doing it on the road against a ranked opponent takes an upset off the table and brings the dreaded blowout into play. If Daniels breaks containment and runs unimpeded throughout the Ball State defense, that’s bad. Mobile QBs inherently present problems for the defense and open up the options for the offense. The Cardinal defense doesn’t necessarily have to stop him, they just have to bend more than they break. Can the offensive and defensive lines dominate their Big East counterparts like they did the Big Ten? Dominance was the word of the day as the offensive and defensive lines had their way with the opposition all night last Saturday. Now granted, the Hoosier lines aren’t your typical Big Ten space eaters, the will of those two Cardinal units was impressive and probably the biggest reason for the win. If the push on the line and the battle of the trenches is lopsided again, that’s a great chance for the Cardinals to shock some folks. Which wide receiver will be the go-to target for Wenning when the Cards take flight through the air? Irish receiver Michael Floyd burned the Bulls for 154 yards and 2 TDs last weekend, and there’s no reason to think that this Cardinal receiving corps can’t find similar opportunities and chances. If Briggs Orsbon or Tori Gibson get loose for big numbers, then it could be a long night indeed for the Bulls and their fans. After last Saturday, I was careful to not got swept up in the emotion of the moment and throw all caution to the wind in terms of my expectations and hopes for this season. Had you asked me last Saturday night after the IU victory and more than a few Fat Tires at Scotty’s, I would have told you that South Florida has no chance. Rationality took over after a greasy breakfast and some Gatorade, but it wasn’t the gloom and doom that seems to have surrounded the program as recent as 9 months or so ago. USF is quite beatable, and in fact, had the Irish not turned the ball over five times, they wouldn’t have walked out of South Bend with a victory. The IU game was virtually mistake free for the Cardinals and to expect that sort of perfection to continue may be a bit much. The Cardinals keep it close, and well within the spread, but walk out of Raymond James a 34-28 loser on Saturday evening. I’ve always said that not all losses are created equal, and with a result like that the passion and fire in this program continues unabated as the Cardinals become the prohibitive favorite for the MAC.